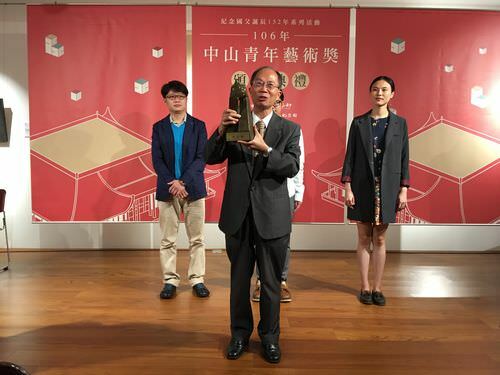 Taipei, Nov. 13 (CNA) The winners at a youth award inspired by the founding father of the Republic of China (ROC), Sun Yat-sen (孫中山), each received NT$300,000 (US$9,938) in prize money in Taipei on Sunday. The Chungshan Youth Awards ceremony was held at the National Dr. Sun Yat-sen Memorial Hall, where the winners, aged 20-45, in the categories of ink art, calligraphy and oil painting were announced. Chen Wei-wen (陳薇文), who won the Chungshan award for ink art with her painting "Through -- Waiting," said the work showcases the flow of time and portrays many windows symbolizing different areas of space. 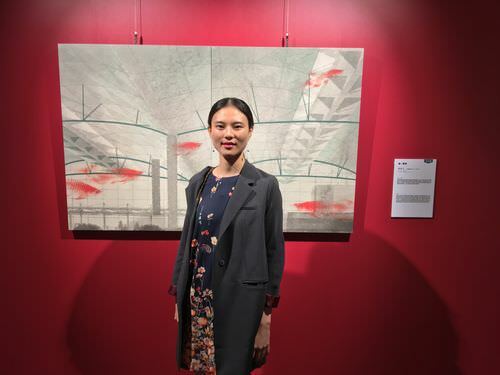 Chen Wei-wen (陳薇文), who won the Chungshan award for ink art poses with her painting "Through -- Waiting". "The painting features Hong Kong airport which I chose because it is a place where people go to start their journey chasing their dreams or somewhere people go to transit in order to get home, it is a place where many different types of exchanges can take place," Chen said. 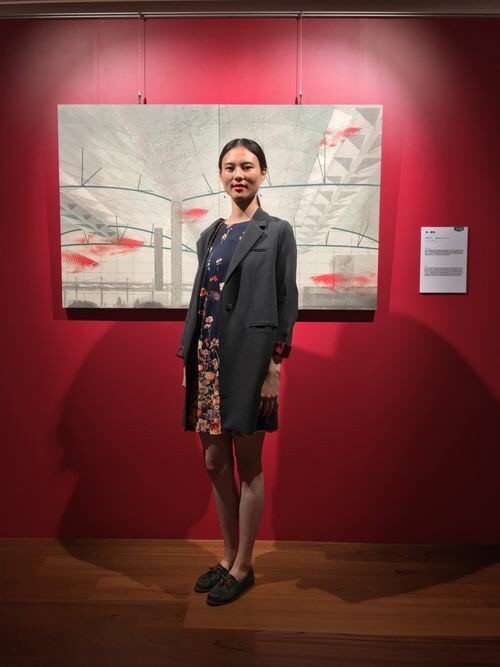 "The fish in the painting is the Asian arowana, a species that has been around for more than 3 million years," she said, explaining that it is like a living fossil she uses to represent the interaction of different times and spaces. Deng Jun-hao (鄧君浩), winner of the Chungshan award for calligraphy with the works "Hanshan's Poetry" and "A Dragon Couplet" said: "Chinese characters are not just strokes and dots, when assembled together have their meaning." 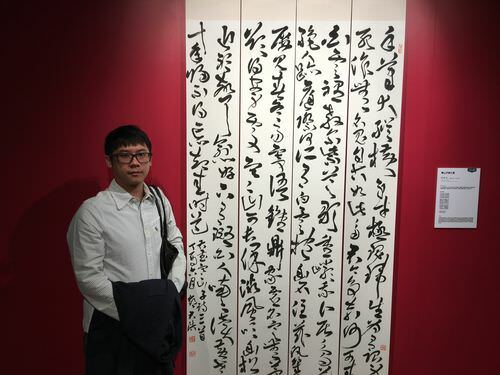 Deng Jun-hao (鄧君浩), winner of the Chungshan award for calligraphy poses with his work. "When the characters are written in a certain way, it can seem like they are moving, like they are singing or dancing," Deng said. Chen Hung-chun (陳宏群), winner of the Chungshan award for oil painting for his work "Dimensional Model XIV," said he was inspired by reading scientific books and uses a hexagon shape to represent the space wrapped around us. 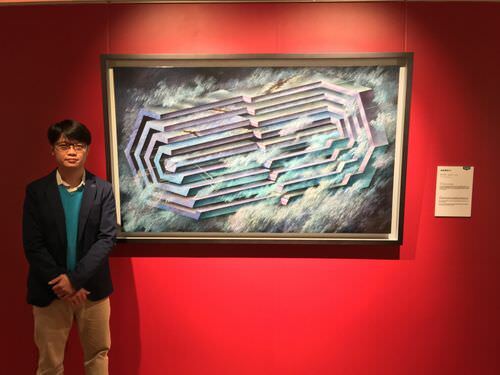 Chen Hung-chun (陳宏群), winner of the Chungshan award for oil painting poses with his work "Dimensional Model XIV". Lin Kuo-chang (林國章), director-general of National Dr. Sun Yat-sen Memorial Hall, said the Chungshan Youth Award, which is in its second year, is an annual event organized by the memorial hall. The event celebrates and awards excellence and innovation in the field of art and culture and represents the spirit of ROC founding father Sun Yat-sen, Lin said. Sun (1866-1925) played a major role in the overthrow of the Qing dynasty, the last imperial dynasty in China, and founded the ROC in 1912.